In many ways, digital transformation equates to rising cloud adoption. Enterprises need the increased agility and flexibility that a cloud environment provides but also want the cost structure associated with cloud. However, new regulations on data sovereignty continue to emerge and security concerns are mounting as data becomes an increasingly valuable asset, creating challenges for enterprises seeking cloud environments. 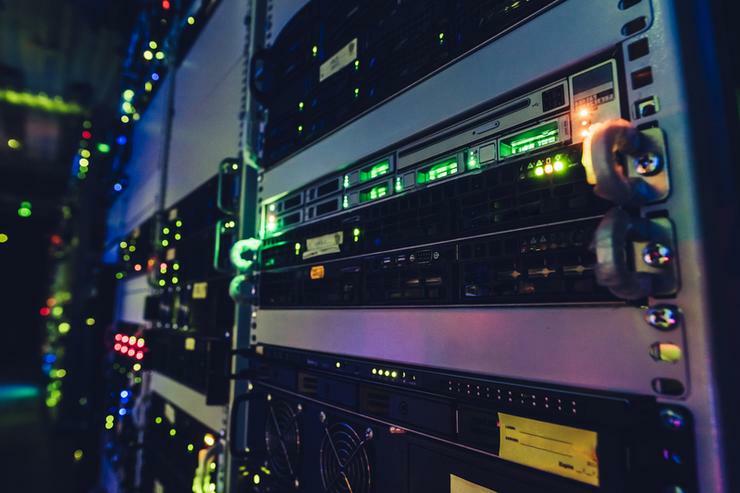 Hardware vendors that initially lost business to cloud providers revel in this shift, as clear markets for both public and private cloud enable infrastructure and services vendors to co-exist. Despite the need for greater control and security of data, enterprises still demand the agility and flexibility afforded by cloud environments and are increasingly demanding OPEX-based consumption models. Many customers purchasing HCI are doing so for cloud environments. More than 90 per cent of hyper-converged infrastructure (HCI) customers surveyed in TBR’s 1H18 Hyper-converged Platforms Customer Research are leveraging or will leverage HCI for cloud instalments. Specifically, 54 per cent are leveraging HCI for hybrid cloud, 30 per cent are leveraging HCI for private cloud, and eight per cent are not currently leveraging HCI for cloud but intend to do so in the future. HCI is well-suited for the cloud as it is highly software-enabled, making spinning it into a private cloud relatively seamless compared to traditional infrastructure environments. Further, HCI sales tend to be more supported with services than legacy infrastructure sales, enabling customers to experience a more collaborative sale. Findings indicate 59 per cent of respondents purchased their HCI solution direct from the vendor, while 62 per cent of respondents received or requested additional hardware services, such as firmware and break-fix, with their HCI purchase. HCI is a lucrative opportunity for vendors as it combines hardware, software and services into a single sale, increasing margins for hardware vendors and enabling vendors to leverage strategic marketing to sell across their entire portfolio stack rather than one-off piecemeal hardware sales. Further, many HCI vendors successfully bundle additional non-HCI sales on top of HCI purchases, as a customer already strongly considering a given vendor’s HCI architecture is likely to consider other solutions in the portfolio. Respondents indicated they frequently make additional hardware purchases with HCI sales. However, these additional hardware sales were not necessarily associated with the HCI appliance, with customers purchasing additional hardware for their data centres in many cases. This suggests a broad portfolio is paramount to enterprise success as IT shops look to reduce the number of suppliers they manage while seeking hardware components to maintain existing infrastructure requirements of legacy workloads and building out new environments for native cloud workloads. This will prove advantageous for multiline vendors in the space such as Lenovo, Dell EMC and Hewlett Packard Enterprise (HPE) but will challenge niche vendors such as NetApp and Pivot3. The rise in consumption-based pricing makes HCI more desirable for cloud instalments. Of the respondents, 81 per cent are considering consumption-based pricing models for future HCI purchases. 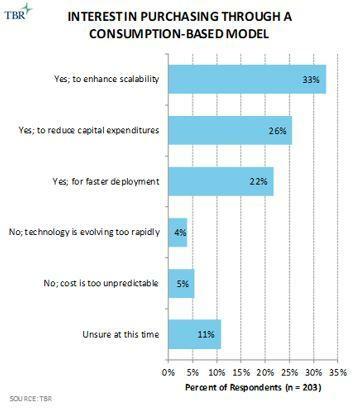 The reasons for considering consumption-based pricing vary, with less than one-third of respondents doing so for the shift to an OPEX model alone, indicating that purchasing decisions are more complex than simply to shift expense structures. However, customers are still intrigued by these new pricing options. The more interest increases for consumption-based HCI purchases, the greater challenges public cloud vendors will face from infrastructure vendors. Dell EMC and HPE both have a strong presence in the consumption-based pricing space, and there are other infrastructure vendors playing in this space less vocally. Competing will be a challenge for public cloud providers as infrastructure vendors message increased security and control without cost increases to battle public cloud options. There will always be a place for both public and private cloud in the data centre market. Although competition will continue to heat up between public cloud and private cloud vendors as evolving market dynamics alter messaging, the need for both instalments in the digitising world will remain. However, as economics become more favourable on the private cloud side, partly due to HCI and consumption-based pricing, customers may consider private cloud options for workloads they previously would have considered a public cloud environment.